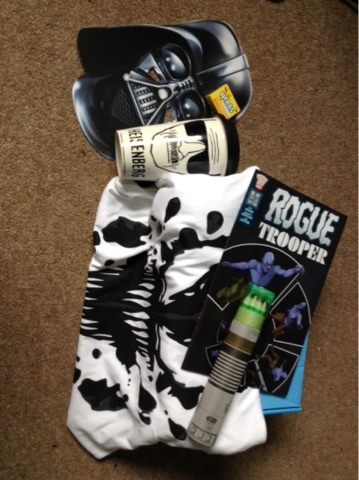 Hello everyone and welcome back to my monthly blog about My Geek box. This months theme 'DARK SIDE'. If you don't know what My Geek Box is, it's a monthly subscription box which comes with different themes of awesome geek stuff. Read on and see what awesome stuff came in this months box. And ENJOY! The first thing I saw in this box was a Darth Vader mash. Which looks awesome. I am a big fan of the star wars films and I am so glad they are making more. Can't wait to go see them. I hope they are as good as the others. I thought this mask would be awesome for a costume party. This part of the box I wasn't so bothered about the sweets. But I still think it's pretty cool getting them as they always taste so good. So I got the nards pack on Lemonade and Cherry. Which to be fair they did taste really good. This next item I loved. As again star wars. But also I love drawing, coloring ect and I recently got some coloring books for when I want to relax or unwind. The fact that it is made to look like a light saber made it fun. I'm in love with the size as it is easily able to be traveled. This mug my boy friend would love as I know how much he loves breaking bad. But for me as I haven't seen it properly I wasn't so bothered. But never the less it might make me want to watch it and it is a good quality mug. I love comics so seeing this made me smile. Another comic to have a good read of and I've never heard of 'Rogue Trooper' before so it'll be interesting of what I think about it. I might do a blog on it when I've finished it to let you know my thoughts. Either way it'll be great to read. Last but not least is the awesome monthly t-shirt. This goes really well with this months theme. Also Venom as a villain is pretty cool and this t-shirt really shows that. Very very pleased with this t-shirt. It would look awesome wearing it around Halloween time. So there is it this months My Geek Box. Hope you have enjoyed seeing this. What was your favorite part of this months box? Stay tuned for next months.